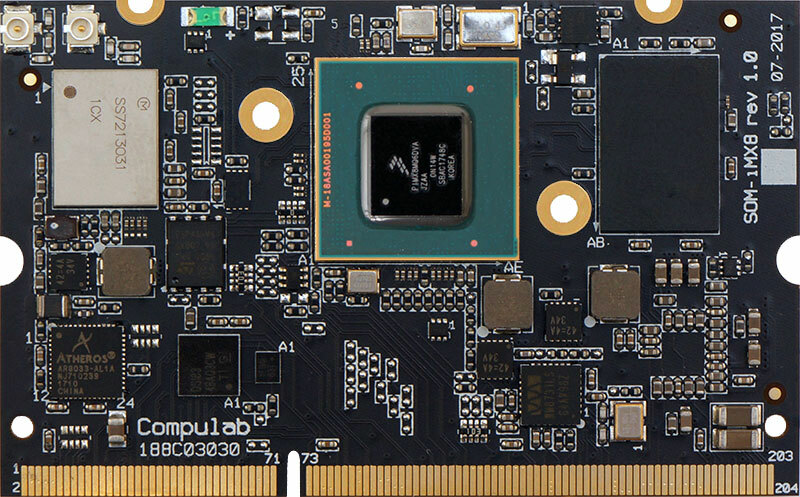 Yokneam, Israel 23-January-2018 – CompuLab introduces CL-SOM-iMX8 – a miniature System-on-Module built around the recently launched NXP i.MX8M System-on-Chip family. High performance video and graphics capabilities and versatile feature-set make CL-SOM-iMX8 a powerful solution for a wide range of applications such as industrial HMI, digital signage, image processing and professional audio equipment. CL-SOM-iMX8 is designed to bring out the full I/O capabilities of the i.MX8M SoC, offering Gbit Ethernet, PCIe, 2 USB3.0 ports, 4 UARTs and up-to 90 GPIOs. Display connectivity is supported with HDMI2.0, LVDS and MIPI-DSI interfaces with resolutions of up-to 4096 x 2160. In addition, CL-SOM-iMX8 features on-board WiFi 802.11ac and Bluetooth 4.1. CL-SOM-iMX8 is offered with full industrial temperature range of -40C to 85C. CL-SOM-iMX8 is provided with full BSPs and ready-to-run images for Linux and Android operating system. The CL-SOM-iMX8 BSP includes Linux kernel 4.9, Yocto Project file-system, Android 8.0 and U-Boot boot-loader. CL-SOM-iMX8 is supported with SB-iMX8 carrier board and EVAL-iMX8 evaluation kit facilitating streamlined and rapid product development. SB-iMX8 carrier-board has been designed for CL-SOM-iMX8 evaluation and application development. SB-iMX8 schematics, bill of materials and layout are available for CL-SOM-iMX8 customers to be used as a reference design for a wide range of industrial use cases. EVAL-iMX8 evaluation kit includes CL-SOM-iMX8 and SB-iMX8 hardware set, an optional LCD panel, PSU, cables and a technical support contract. 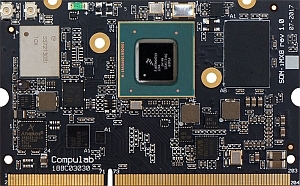 CL-SOM-iMX8 is available now through CompuLab’s worldwide distribution channel and through direct sales (www.compulab.com). CL-SOM-iMX8 is offered at a variety of configurations starting from $68 for volume orders. EVAL-iMX8 evaluation kit is offered at $375. Detailed ordering and pricing information is available at the CL-SOM-iMX8 product page. CompuLab products are used in digital signage, telecommunication, industrial automation, gaming, medical devices, aerospace and marine systems and countless other applications.